A diagnosis is a definitive assessment of a patients dental/medical condition comprising of both a subjective assessment as well as an objective evaluation of all the information gathered. Diagnosis is based upon objective facts and evidence! An in depth examination is the basis for a comprehensive diagnosis that substantiates comprehensive treatment. For treating clinicians “objective documentation” must be presented in arbitrating conflicting subjective opinions”, beyond a reasonable medical certainty. There is sufficient supportive evidence showing efficacy for the use of Low Frequency Transcutaneous Neural Stimulation (TENS), Electromyography (sEMG), Jaw Tracking (Kineseography/CMS) and Electrosonography (ESG) in the Diagnosis and Treatment of TMD. The FDA approved indications for use for the J5 Dental TENS and the K7 Evaluation System have been recognized. The K7’s ADA Seal of Recognition (from 1986 to 1994) and ADA Seal of Acceptance (from 1995 to 2007) has been recognized as an aid for the diagnosis of TMD. K7 Technology is ADA and FDA approved and meets the standards of reliability and validity satisfying the requirements of sensitivity and specificity that are essential for clinical diagnosis of individual patients. The American Dental Association (ADA) and the Food and Drug Administration (FDA) have recognized and accepted the science and validity of K7 electrodiagnostic instrumentation as acceptable aids in the diagnosis and treatment of temporomandibular joint dysfunction. 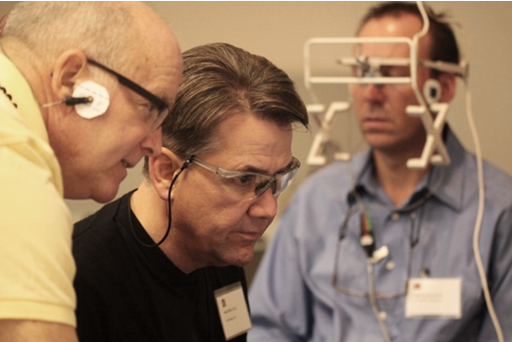 Because of inherent philosophical differences, teachings and education within the dental profession (subjective vs. objective views on occlusion and TMD) the ADA and FDA has caused the use and implementation of objective measuring instrumentation in dental practices to grow and be accepted among practicing clinicians in North America. Subjective assessment is often the unfortunate standard of care rather than objective combined with subjective evaluations of their patients. NOTE: Computerized instrumentation (K7 kineseograph) is not a treatment philosophy as many skeptics have tried to lead the dental profession to believe. Electroninc instrumentation only knows how to measure. It doesn’t have a bias as to a TMD or occlusal philosophy. The K7 is a highly sensitive and accurate technology. The K7 is only as good and useful as the operating clinician understands, is trained and knows how to interpret the data. It is like any musical instrument (e.g., the violin). The music and sound that is developed from the instrument is only as good as the training and skill of the musician. The same with any dentist who uses and implements this technology in his/her dental office. The purpose in using low frequency TENS for any TMD patient and dentist is to relax spastic masticatory muscles. Straining musculature is the hidden, yet commonly undetected problem with most TMD/orofacial pain problems. It is the straining and tense muscles that contribute to most muscular headaches, neck aches, facial pains and malocclusions not observed on any MRI, tomogram or any form of radiographic imaging. Diagnosing a proper lower mandibular to upper maxillary jaw relationship in 6 dimensions requires an accurate yet physiologic diagnosis, establishing a reliable relationship between these two entities. A diagnosis based on relaxed muscles is a medical therapeutic and reasonable model, not strained, asymmetric, torquing and skewing muscles that most treating clinicians commonly don’t test, measure, neither accurate document in their overall examinations. Assuming that the TMD paining patient can relax their tense jaw muscles to record a bite relationship for a splint or some intra oral appliance to be made is in fact a misnomer. Distorted mountings of between the upper and lower model casts in the laboratory will definitely result further compounding the occlusal, joint and head posture problems, especially, when numerous occlusal adjustment visits under these circumstances can result. The body has an ability to adapt and accommodate and so does the bite/occlusion in a TMD patient. But when the adaptive and or accommodative capacity to maintain a certain level of comfort has been exceeded beyond their physiologic comfort levels the muscles begin to strain, become tender and painful. Remember: Muscles is the most common underlying problem with most TMJ/TMD problems. Most TMD pain comes from the muscles not the temporomandibular joints. Computerized mandibular scanning or what others simply call “Jaw Tracking” is a technologically advanced tool to visualize real time jaw movements and jaw positioning using FDA and ADA approved computerized software and very light weight sensor array that is placed on the patients head to help record accurate mandibular movements without restrictions. The clinician is able to observe on screen exactly whether the mandible is able to move freely without jerky (dyskinesia) or abnormal slow (bradykinesia) movements. It also aids in determining mandibular restrictions, aberrant swallowing patterns as well as whether the mandible is able to relax relative to the patient’s terminal centric occlusion. This advanced technology allows the dentist to see things not typically visible with the naked eye, but at a microscopic perspective of the details of the quality of jaw rest, location relative to the patients centric and quality of jaw function. To have the patient open wide and close, move their jaw left or move right and or protrude or retrude is not good enough in deciphering cervical dysfunctions from TMJ primary problems from Class II division 2 and anterior open bite tendency TMJ problems. Accurate objective measurements of the TMD patient’s ability to open and close the jaw as well as the to relax and rest their jaw optimally can be only observed with CMS technology. Remember: The quality of the mandibular functioning ability of a person and the quality of the mandibles ability to rest is significantly different from physiologic healthy opening and closing vs. dysfunctional opening and closing movements. Surface EMGs are an electromyographic test used in dentistry, like in the field of medicine, to evaluate and record electrical activity produced by the masticatory muscles of the head and neck regions. EMGs is performed using an instrument called an electromyograph, to produce a objective recording called an electromyogram. An electromyograph detects the electrical potential neurologically generated by action potentials within a skeletal muscle. The signals can be analyzed to detect dental abnormalities, activation levels at rest, or recruitment levels during function in order or to analyze the quality of the biomechanics of of movement and resting modes the jaw system. Trained dentists are taught how to properly interpret EMG data to further determine whether abnormal temporalis anterior muscles groups, masseter muscle groups, digastric/suprahyoid groups and or cervical group EMGs are functioning normal or abnormal. These are key muscles in the masticatory system that are monitored to help determine whether there is a TMD postural problem or not. EMG is used as an advanced diagnostic aid in identifying and detecting neuromuscular diseases. EMGs are also used as a research tool with various Universities around the world in the study of kinesiology, and disorders of motor control. It is a powerful tool in the hands of skilled and trained clinicians. Remember: Cursory muscle palpation examination done by and dental examiner is based on his/her subjective understanding and the patients responses. EMG recordings bring an objectivity to this muscle assessment beyond a patient’s complaint. EMGs do not measure or record levels of pain. There is a broad body of literature that supports the physiologic basis for using surface EMG as an aid in assessment of muscle function/ dysfunction. (38 + studies support this ending with Lynn et al, 1992). There is substantial evidence based upon controlled studies that confirm that surface EMG is reliable and reproducible. (18 studies ending with Dean et al., 1992). 87 studies verifying the use, safety, and efficacy of EMG to monitor masticatory muscle function/ dysfunction. “In summary, based on well controlled empirical and clinical studies that have been conducted in several universities over the past three decades throughout the world, there is unequivocal evidence to strongly support the use of EMG for the evaluation and diagnosis of temporomandibular disorders.” – Robert Jankelson, D.D.S. Those clinicians and so called experts who claim that EMGs are not reliable or accurate or often those who are the most uninformed and untrained. ESG or Electrosonography is advanced technology that utilizes a kinesograph to measure intracapsular TM Joint sounds against normalized data. Duration of these joints sounds, exact location of the occurrence of these sounds (clicks, pops, grating) during jaw opening/ closing, or lateral jaw movements can be documented objectively. A spectral frequency analysis of these sounds can also be used to distinguish high vs. low frequency joint sounds as well as high or low amplitude signature joint sound patters. Without this information, one cannot adequately restore function free of intracapsular interference resulting in decreased muscle tenderness on palpation. ESG technology aids in identifying limited or increased range of motion free of restrictions in order to more efficiently resolve patient complaints of TMD pain. A paired set of ultrasensative eletro-transducers are place by a lightweight headset over the temporomandibular joints. Vibrations from each joint during opening and closing of the mandible are monitored by the transducers, amplified and inputted into the kineseograph (K7 computer) for display, analysis and data storage. The joint sounds are analyzed via the kineseograph in terms of amplitude and frequencies present relative to occurrence in the opening and closing cycles. It is a valuable adjunct used in conjunction with other clinical diagnostic modalities to confirm such conditions of joint pathology. All Myotronics devices are registered with the U.S. Food and Drug Administration and have received permission for doctor use and application under 510(k) pre-market notifications. This reflects that the U.S. Government and the dental profession acknowledges the safety and efficacy of these devices as recording and measuring devices used in the diagnosis and management of TMD and orofacial pain.